Visa: Only required for few countries including China, Bangladesh, Ethiopia, Kenya, Eritrea, Nepal, Nigeria, Pakistan and Somalia. 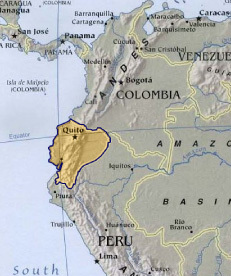 Our Pacha Mama, Ecuador, is geographically one of the smallest South American countries. She is located between Colombia and Peru and fronts the Pacific Ocean. Her diminutive size however, belies what a quick glance at the map reveals. Straddling the equator and cleaved by the mighty Andes Mountains, Ecuador is home to four biologically distinct regions. A virtual laundry list of natural phenomena await the eager: active volcanoes, tropical rainforest, the cloud forest, coastal wilderness, the haunting and lonely paramo, and the inimitable Galapagos Islands. Ecuador has more than 24 life zones, including mangrove swamps, rainforest, cloud forest, paramo, and dry tropical forest. Her colonial towns retain a large part of their history and ancestral knowledge. Archeological discoveries in 2013 high in the Andes hint at the life of the final sovereign Incan emperor Atahualpa, whose demise portended the vibrant colonial period in Ecuador. Ecuador is a destination suitable for all: nature lovers, sport-adventurous, golden age, biologists, families and more. Come and share this unforgettable experience with us!!! Copyright © 2019 Pachaquilla Tours. All rights reserved.